On our way to some glorious back country skiing in Austria we spent three grand days in Munich and one beer soaked night the its famous Hofbrau Haus. 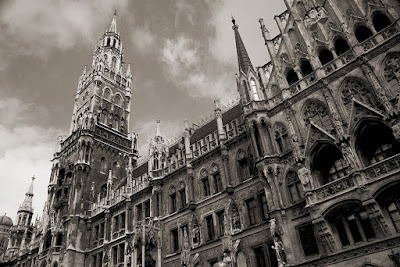 The heart of the Bavarian Capitol's Old Town is the broad urban plaza called the Marienplatz. This ornate building once housed the state's legislature. A light rain had just fallen leaving the air clean and the details of the grand ediface ever so sharp.